Dhaka, 26 Feb, Abnews: Samsung unveiled its new flagship smartphone on Sunday with a focus on augmented reality features as it seeks to keep its title as the world’s biggest smartphone maker. 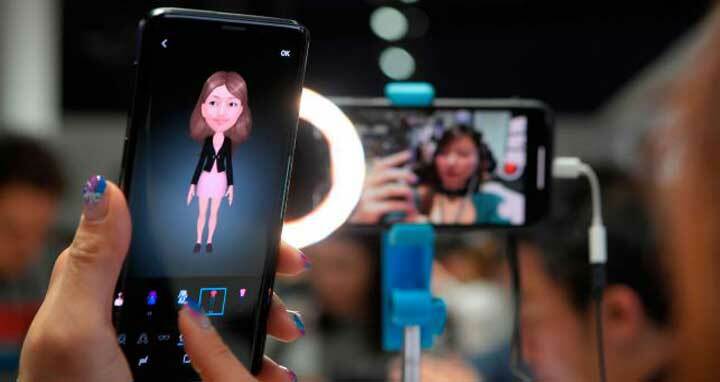 The South Korean firm showcased the Galaxy S9 on the eve of the official start of the Mobile World Congress in Barcelona, which comes after a year of flat smartphone sales. With no other major handset maker using the annual event, the world’s largest phone show, to launch a new flagship device this year, Samsung had the opportunity to grab the spotlight. The S9 features essentially the same design as last year’s previous flagship, with the full screen and curved glass edge of the S8, which was followed by Apple’s iPhone X and others. Samsung also included a dual lense camara on the Galaxy S line for the first time, which will improve low-light capture and enhance slow motion video, which is popular on social media. “Despite these incremental innovations, Samsung will have to smartly leverage its brand and marketing machine to correctly position the new smartphones to a target audience,” said Forrester analyst Thomas Husson. Global smartphone sales fell by 6.3 percent in the fourth quarter due to slower than expected Christmas sales, according to research firm IDC. Overall global smartphone sales for 2017 were virtually flat-down 0.1 percent at 1.47 billion units-as phone makers struggled to come up with innovations that encourage customers to upgrade their devices. Samsung suffered a humiliating recall of its Galaxy Note 7 device in 2016 after several devices exploded, but its Galaxy 8 smartphone was a consumer and critical success. While it kept its lead over Apple as the world’s biggest seller of smartphones in 2017 with a 21.6 percent market share, up from 21.1 percent in the previous year, Samsung faces stiffer competition from Chinese rivals like Huawei and Xiaomi that offer cheaper handsets with many high-end features. The S9 will sell for 859 euros ($1,055), a price which analysts warned could turn off many consumers. While the S9’s camera is “markedly different” in quality from older smartphones that people already own “consumers may delay purchase because of rising flagship prices,” IHS Markit said in a research note. Huawei unveiled a new laptop and tablet in Barcelona earlier on Sunday but will present its new flagship smartphone-the P20 -- on March 27 in Paris. Thomas said this will allow it to “fine tune its marketing message based on how the new Samsung S9 devices are perceived by consumers”. Earlier on Sunday South Korea’s LG unveiled the V30S-an updated version of its flagship V30 smartphone launched six months ago-which features higher memory and artificial intelligence-based technologies that focus on photos and voice recognition.